A unframed collage of simple bistro glasses stands in the lobby of Palazzo Pancrazi, Barga’s municipal hall. Tinted with red wine, they look unprepossessing at first glance. But their nuances chronicle a moving history of the town — and beyond that, of the larger peasant world that is its evocative setting. 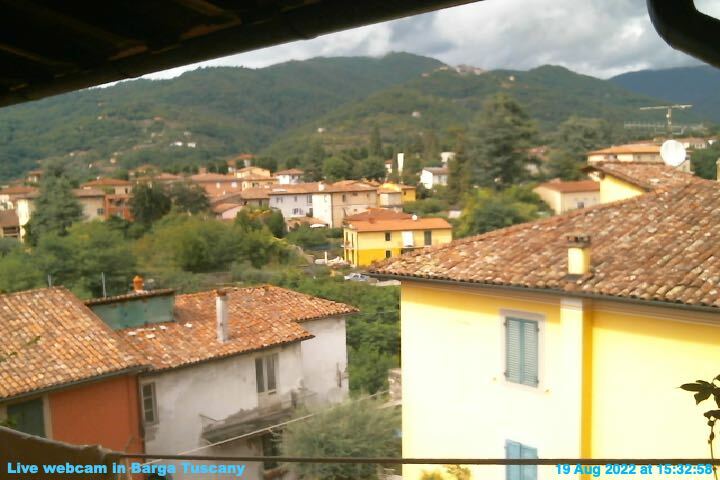 “This is where Barga is, and where it has been,” says the painter Keane. He executed the collage’s 16 canvases in oil, each measuring 40-by-40 centimeters, then arranged them in four columns of four in descending order — the fullest glass at the upper left, progressing gradually to a nearly empty glass at the lower right. “The subject is tradition and change in a small mountain town,” he explains, a theme that has occupied his attention for two decades. The genesis of this work begins with much earlier oil portraits of the same simple bistro glasses, also holding red wine, completed more than 15 years ago by Keane and Tiziana Fontana, his wife and a notable painter in her own right. 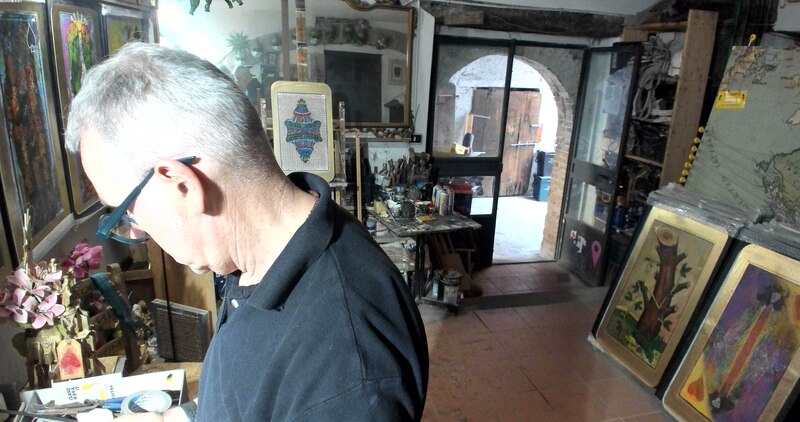 Three of her original glasses stand next to Keane’s new work in Palazzo Pancrazi. As the years progressed they have taken on ever greater iconic meaning for Keane. Wine, of course, is in itself an ancient symbol of Italian rural tradition, reaching back at least three millennia. In that respect, it is a metaphor for an entire way of life that is deeply rooted in the land and the memory of its inhabitants. Yet wine is also a physical product of the earth, with specific properties that include a tendency to evaporate when not sealed into a barrel or bottle. The meeting point of these two identities in Keane’s work — wine as metaphor and wine as a tangible collaboration of human effort and earthly bounty — is the red stain that grows ever larger on the inside surface of the glass as the wine steadily diminishes. The wine, in that sense, is the present. Its residue is the past, preserved in the stubborn trace of memory. The wine of Barga, both metaphoric and liquid, was forcefully assertive when Tiziana Fontana and Keane painted their first bistro glasses at the close of the last millennium. It was drunk, most memorably, at the caffe known today as “Da Aristo” and then simply as “Casciani’s,” the surname of the family that had owned and run it since the mid-nineteenth century. The late Aristodemo Casciani was its proprietor until 2008, when he handed it over to his son-in-law Marino — who sold it three years ago to the present amiable owners, Lorenzo, Giovanni and Antonella Togneri. When Aristo still manned the caffe, huge rounds of cheese cluttered the floor, the air hung heavy with the odor of curing sausages and fermenting grapes, and the walls and ceilings bore the stains of a century and a half of cigarettes and cigars. At the slightest encouragement, Aristo would reach for his accordion or sit down at his piano, lodged under a shelf groaning with bottles of aperitivi and digestivi dating back to World War Two and sometimes beyond. The band known as “the Aristodemo’s,” with Keane as its percussionist, are his direct heirs. It was under Aristo that the caffe became the social center of a local musical culture that has since drawn into its fold a famous piper from Scotland, world-class trumpeters, trombonists and saxophone players, guitarists, composers and singers, and at least two ukulele strummers, one from the mountainous northeast of California and another from Helsinki, Finland..
Music, in the residue of memory and tradition that clings to Keane’s wine glasses, remains an immensely vital component. Others have faded, still present in memory but gone almost certainly forever from the town’s active life. As late as the 1990s, when I became a resident here, the transumanza — the twice annual migration of shepherds and their flocks between lowland meadows in the Serchio Valley and highland pastures on the borders of Emiglia-Romana — was still undertaken. In the late autumn, as the temperatures fell, Piazza Salvo Salvi and the Via di Mezzo were suddenly filled with bleating sheep, making their way west. A shepherd would drop into Aristo’s, a thick hand-sewn cape over his shoulders, and order a few of those glasses of wine. After years of lonely wandering with their flocks, the shepherds weren’t much inclined to conversation and tended to speak only in barely understandable dialect. But to a man, they were musicians, albeit on instruments that were as venerable as their capes and vocabularies: a rough-hewn ancestor of the flute, or a wooden frame strung with thin staves that sounded an indescribably poignant twang. When the bistro glasses brimmed with wine, music, clothing, words and ideas still bore the stamp not only of intimate engagement with the distant and sometimes prehistoric past, but also with the mountains, valleys and forests that define the Garfagnana. Pipistrelle bats and swallows performed their stunning ballets in the evening skies over Barga. In the early years of my sojourn here, I occasionally found hedgehogs on my terrace, and once a terrified mole at the top of my second-floor stairway, where he had been deposited by a feral cat for a future snack. I eased him into a box and liberated him a safe distance from my vegetable garden. Barga was also a story-teller’s world then, where tales were related in an almost Homeric verse by men with nicknames like “Lombo” and “Sacco,” whose real names were never used, or sung by the wildmen shepherds in a cadence so eloquent that it didn’t matter if the words were incomprehensible. A woman named Antonietta, Ukrainian by birth, told me on one dark winter evening how she had fallen in love with a young Italian when they both survived a concentration camp deep in the Soviet Union, and set out with him in 1945 to walk back more than 2,000 miles to his native Barga. The young man had what was probably tuberculosis and died in her arms. She was 18 years old. But she made it here, fell under the spell of the mountains and traditions, raised a son, and became herself an iconic Barghigiana. In the wine glasses of Keane and Tiziana, Antonietta too lives on. Frank Viviano is the author or co-author of seven books, including the critically-acclaimed Blood Washes Blood, Dispatches From the Pacific Century and In the Balkans (with Magnum photographer Nikos Economopoulos).